Both Lewis and Paul capture the bleakness of life before Christ and the exuberance after He comes. The Advent serves as an incredible opportunity for all believers to remember what it was like for Narnians and shepherds 2000 years ago who eagerly hoped and anticipated the first, true Christmas. In perhaps the most quotable lines from the Chronicles of Narnia series, C.S. Lewis captures the dominion of the White Witch with the phrase, “It’s always winter, but never Christmas.” Soggy boots, chattering teeth, dark skies and numb fingers communicate to young readers what the Narnians felt: despair. Who would want to live in a world with no Christmas? Blustery winds without jingle bells, ice covered limbs without bulbs and lights, utilitarian use of fireplaces without stockings hung with care. For the Narnians, Christmas represented a beacon of light and hope in wintery days. It signaled the reign of Aslan the Great and the end of the White Witch. Although wrought with fantasy, Lewis’ tale echoes one that happened almost 2000 years ago. 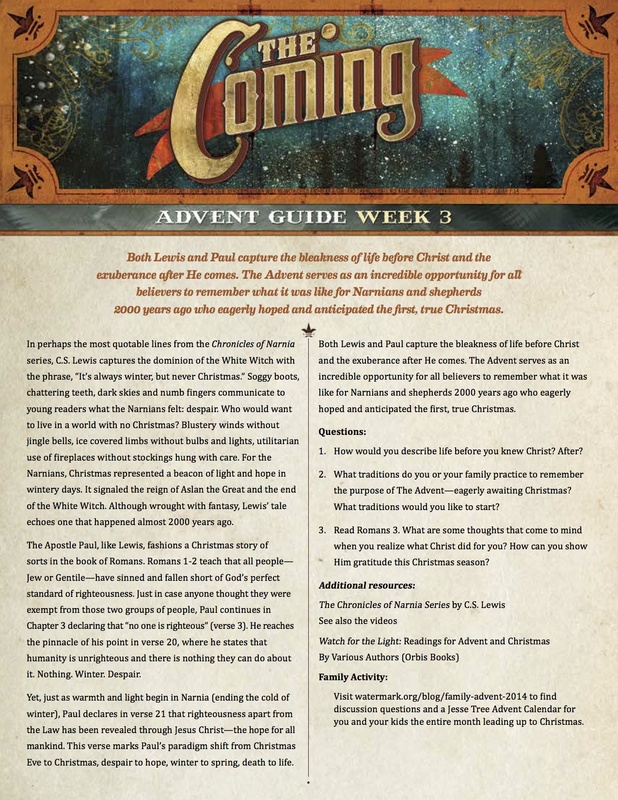 The Apostle Paul, like Lewis, fashions a Christmas story of sorts in the book of Romans. Romans 1-2 teach that all people— Jew or Gentile—have sinned and fallen short of God’s perfect standard of righteousness. Just in case anyone thought they were exempt from those two groups of people, Paul continues in Chapter 3 declaring that “no one is righteous” (verse 3). He reaches the pinnacle of his point in verse 20, where he states that humanity is unrighteous and there is nothing they can do about it. Nothing. Winter. Despair. Yet, just as warmth and light begin in Narnia (ending the cold of winter), Paul declares in verse 21 that righteousness apart from the Law has been revealed through Jesus Christ—the hope for all mankind. This verse marks Paul’s paradigm shift from Christmas Eve to Christmas, despair to hope, winter to spring, death to life. How would you describe life before you knew Christ? After? What traditions do you or your family practice to remember the purpose of The Advent—eagerly awaiting Christmas? What traditions would you like to start? Read Romans 3. What are some thoughts that come to mind when you realize what Christ did for you? How can you show Him gratitude this Christmas season? Visit watermark.org/blog/family-advent-2014 to find discussion questions and a Jesse Tree Advent Calendar for you and your kids the entire month leading up to Christmas.